First off, must give some kudos to Todd Engle and the folks at Friendsview for hosting us last week. What a nice lunch…delicious food attractively presented, nice table decor, and helpful, friendly staff. Thanks so much. Newberg High School Principal Dave Parker introduces our speaker. 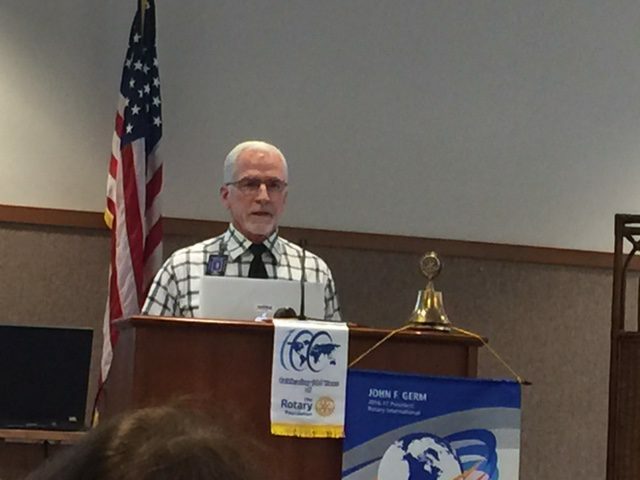 A fellow Rotarian, Bill Rogers from the morning club, was our presenter. 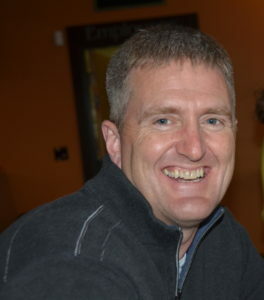 Bill is the principal of the Newberg High School Alternative School. He was introduced by Newberg High School Principal Dave Parker, who indicated that the Alternative School offers another opportunity for students to be successful. Our own Paula Radich originally hired Bill. The school’s first home had a few issues….roof leaked a lot, birds lived in the walls. Luckily, improvements were included in a successful 2011 bond measure. In 2012, the existing buildings were demolished and the school set up temporary quarters in the basement of the Northside Community Church. They graduated 12 students that year. The Springbrook Education Center on Deborah Road opened in 2013. There are 117 students in the program now. Most come from Newberg High School, although some come from Amity, Dayton and Sherwood. What does an Alternative School do? Newberg High Alternative School Principal Bill Rogers told us about the program and the kids who attend. The goal is to get kids to graduate. “Get ’em on the stage!” declared Bill. Many who do are the first high school graduates in their families. “The very personal and relational” aspect of the program. 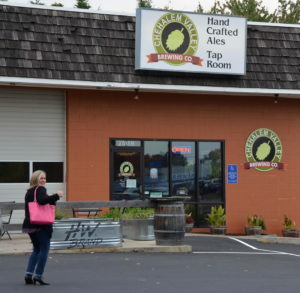 Guests last week included Kaaren Hofmann, a City of Newberg engineer who told us briefly about a pavement maintenance and funding master plan that is being developed by city staff and consultants. With this, the City will look at establishing new funding to better take care of our roads. City Council plans to review the plan in November and take action yet this year. For more information, contact Kaaren at 503-537-1273 or at kaaren.hofmann@newbergoregon.gov. Alex Brown attended for the second week in a row, and Brandi Cornelius from the Anvil Academy was Denise Bacon‘s guest. Jim McMaster‘s son Taylor also paid us a visit. As I’m sure you can tell, Auggie Gonzales was not available to be our photographer last week, as he was visiting family in Mexico. Don’t forget to mark your calendar for Thursday, Nov. 17 at 6:30pm for a joint meeting with the Early Birds Club to hear a very special presentation from a holocaust survivor. Posted on October 31, 2016 under in E-Newsletter | By Suzanne Miller. 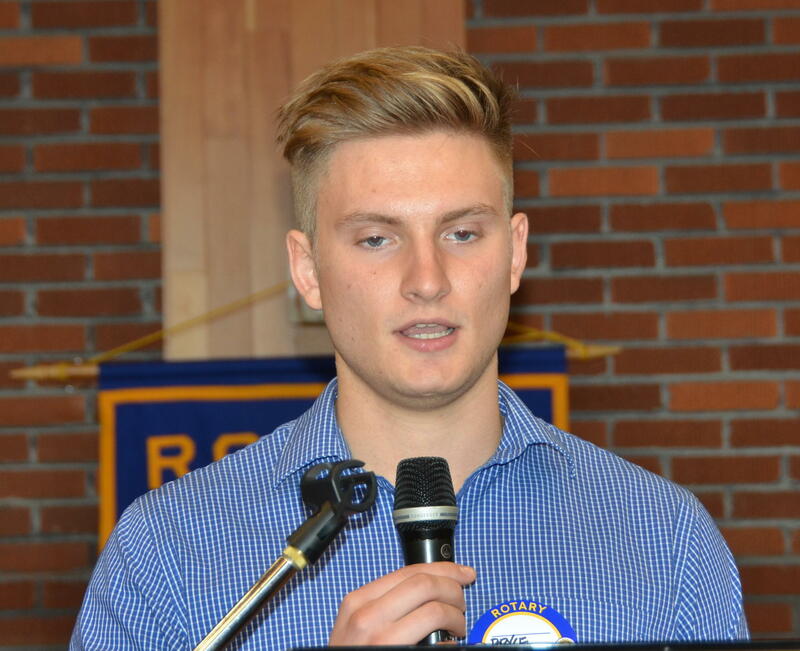 The opportunity that Bryce Schubert, our speaker last week, was referring to was RYLA, Rotary Youth Leadership Awards. 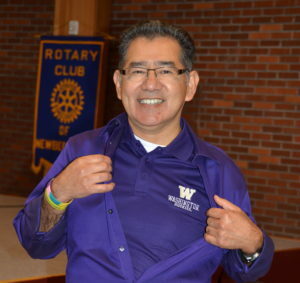 He had recently completed a week at a RYLA “camp” at Menucha in the Columbia River Gorge. Club member and Director of Portland Community College’s Newberg Center, Lynn Montoya Quinn encouraged Bryce, who is a 19-year-old nursing student at PCC, to apply. He “wrote essays,” completed the application process, talked to his grandma, was interviewed and was selected. One of the biggest takeaways, Bryce said, “was seeing people open up” and blossom from the training. 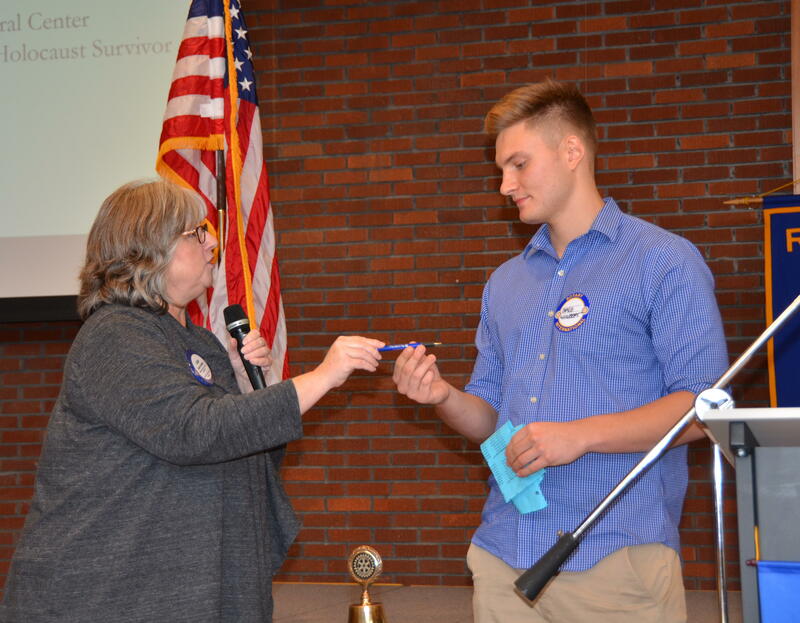 President Leah presents a Rotary pen to Bryce. He is committed to his gym workouts. “My goal is to play football,” he said. He is very appreciative of the “great opportunity” he was given. Please don’t forget: We’re meeting at Friendsview this week!!! Our guest last week was Alex Brown from Willcutts Realtors. And after the meeting, many Rotarians headed out to the ground breaking for our new community Aquatic Center! Nothing like a change of pace to liven things up. 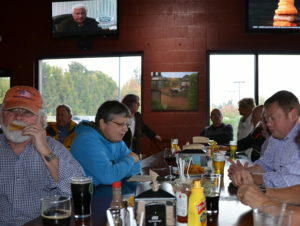 Instead of a regular lunch meeting with a speaker last week, we had a “social hour” at 5 pm at Chehalem Brewing. Since there isn’t a program to report on, thought I would share some comments/conversations heard while walking around the tables…. 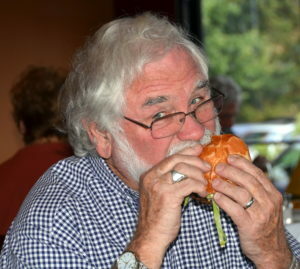 Walter likes the burgers at Chehalem Brewing. Chehalem Brewing has one of the best hamburgers in town, according to Walter Want. Walter and Julie had recently returned from two weeks on the East Coast, where they were attending a reunion of Walter’s military unit. They visited Williamsburg, Virginia, the Shenandoah Valley and the Appalachian Trail. They even had a brief encounter with Hurricane Matthew………. 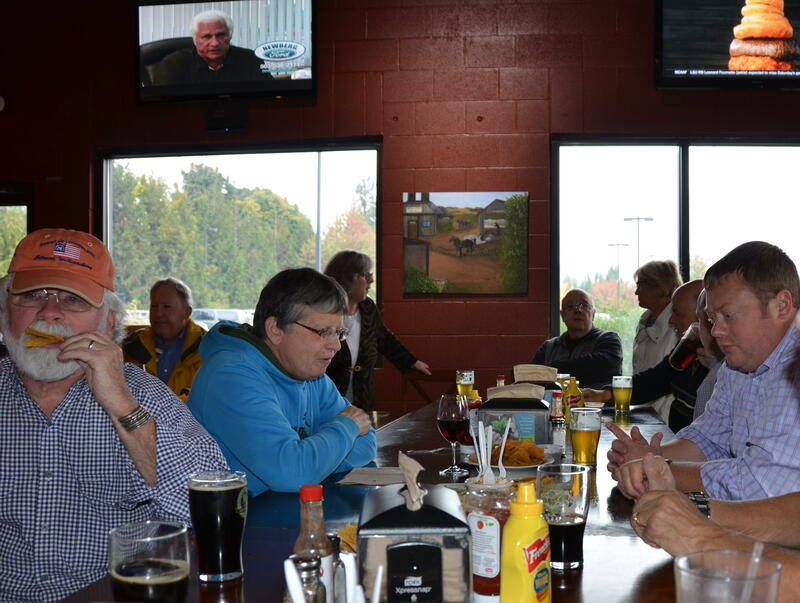 “This social hour was a good idea,” said Curt Walker. “At the regular meetings, you just don’t get enough time to really talk with someone.” In chatting with Curt’s wife, I learned that Curt has owned a Harley Davidson motorcycle for over 30 years. Who knew? President Leah and Mike Caruso were talking about the recent club board meeting. 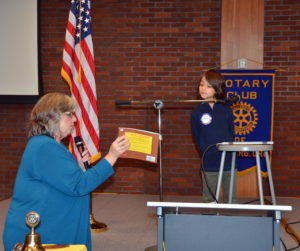 Leah said that “Stop Hunger Now” may be a future project for our club. 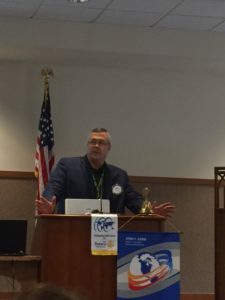 Mike said things will be gearing up for the “100 Peace Pole” project and hopes are to locate at least 10 in the Newberg area at parks, schools and churches. More info on both of these projects will be coming soon. Life is good for Eric Bergquam right now. Things are going well for Dentist Eric Berquam. He and his son are looking forward to the start of ski season. Spike Sumner reported he was taking Auggie Gonzales and Grant Gerke to lunch the next day to settle a bet on the Ducks/Huskies game. He was taking them to Jem 100 for cheeseburgers and tater tots. (“That’s what they want!” he said.) According to Auggie, however, there was a suggestion that steaks might be in order…especially since Auggie and Grant have been buying for years. Paul Jellum was talking about “Operation Christmas Child,” where shoeboxes are filled with gifts for needy children. This project is sponsored by Samaritan’s Purse. It’s so easy! Find a shoe box, decide whether you will give to a boy or girl, fill the box with gifts (including one “wow” gift), and drop it off. Paul said over 135 million boxes have been donated over the last 2o years. For more information, please go to the Samaritan’s Purse website or talk to Paul. John Kerkanich joined us via tv–see him in the upper left hand corner of the photo? Paula Radich is busy looking after her mom, who lives in Portland and will be 98 on Dec. 1. Grant Austin has been doing a lot of traveling in his sales position with Adec. He has recently been in Kansas and Philadelphia, and was leaving the next morning for Pendleton and then Alaska. And even John Kerkanich joined us….on television! Nicole McIntyre gives a thumbs up to the meeting venue. Back to normal this week….see you at the Cultural Center. “A Year in a Permaculture Garden.” Sounds like a topic for a high school thesis paper or something, right? 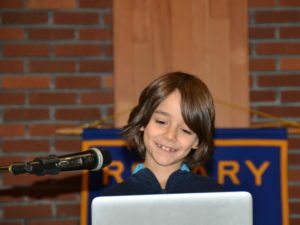 Then you can imagine how amazing it was to have a second-grader give a presentation on the subject in front of a large crowd of Rotarians last Wednesday. 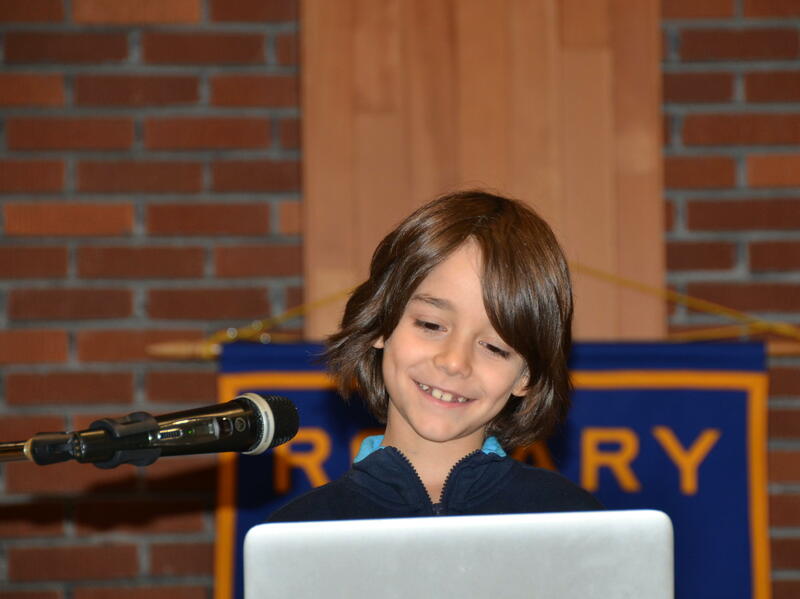 Jude Arreola, probably our youngest presenter ever. And not just any second-grader, either. President-elect Todd Engle‘s grandson, Jude Arreola, joined us to talk about a philosophy of agriculture and design that involves working with, rather than against, nature. Jude’s hobbies include gardening, insects and birds, and it was obvious that he has already studied and learned a lot. His program featured many pollinators, plants, pests and predators. For example, he helped us identify types of vital pollinators like bees, flies, beetles and butterflies. And he identified plants that help to attract and support them, such as milkweed, amaranth, and unusual fruit trees like persimmon that we might want to consider for our own gardens. 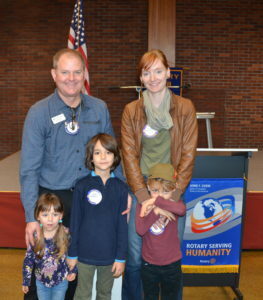 President-elect Todd with Jude and his family. Jude, who is 7 and is home-schooled, was accompanied by his mom, Emily; brother Ollie and sister, Stella. His parents own the White Rabbit Bakery in Aurora, and the family lives in Woodburn. When asked if the pictures he showed were of his own garden, Jude pointed at his Grandpa and said, “No, it’s HIS garden.” So NOW we know what Todd does in his spare time! 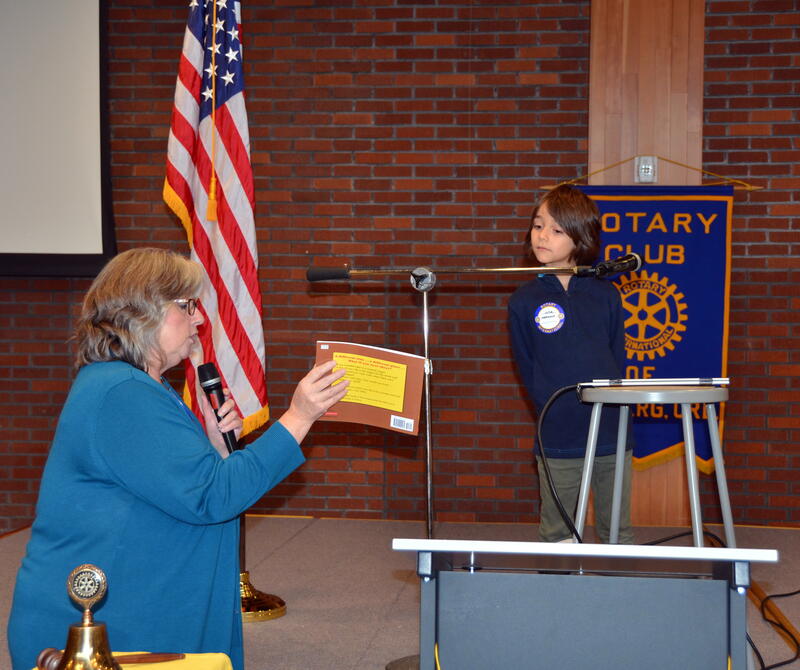 President Leah presents Jude with a library book dedicated in his name to thank him for his talk. 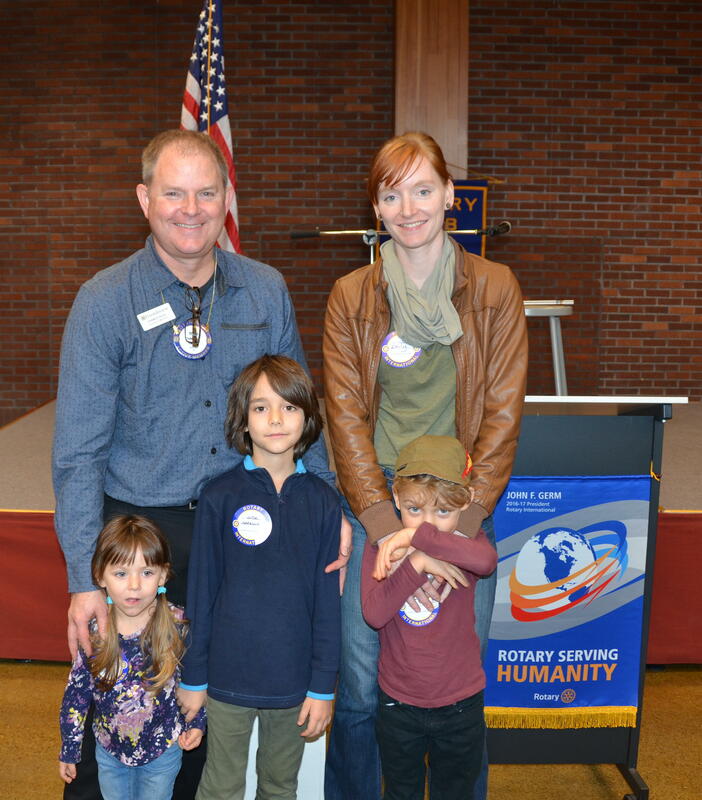 Visiting Rotarian last week: Britt Dudek, apple and cherry grower from Wenatchee, WA joined us for a second time. Guest: Linda Cohen, author and professional speaker, was a guest of Mike Caruso. Linda has been hired by the Jubitz Foundation to coordinate the Peace Pole Project, an effort to “plant” 100 peace poles around the Portland area in honor of Earth Day next year (April 21, 2017). Newberg has one at Memorial Park and one at Francis Square, and a number are located at the North Valley Friends church site. President Leah is considering placing one at the library, and Fred Gregory is looking into the possibility of locating one at George Fox. If you might have a location and are interested, please contact Linda at linda@lindacohenconsulting.com or call her at 503-730-8750. Auggie unveils a surprise under his purple shirt. Had to include this photo of University of Washington grad Auggie Gonzales, who was probably in an extremely good mood after his team’s 70-21 drubbing of the Oregon Ducks last Saturday. Auggie predicted the win at our meeting, and I suspect we have not heard the end of it. 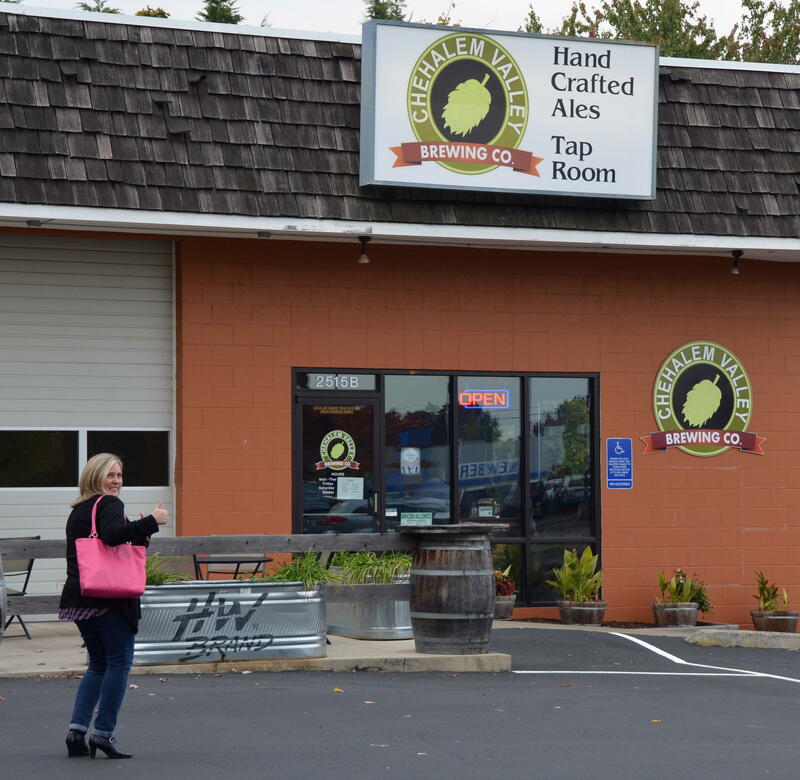 REMINDER: We’re meeting at 5pm this Wednesday–not noon– for Social Hour at Chehalem Brewery. If you have not RSVP’d yet, please do so!